The eagle is floating! 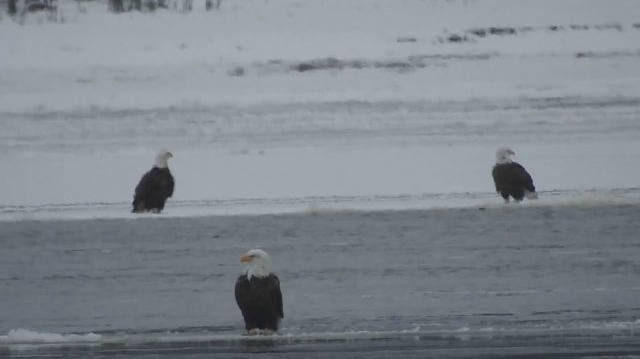 A couple of bald eagles decided to rest their wings and instead float down the Mississippi River in Illinois. The unusual sight was captured on camera by Brian Woolman who was standing alongside the banks of the river when he noticed the beautiful birds on their journey. One bald eagle comes into the frame until moments later when a second bald eagle is seen enjoying the rush of being moved along by the rapid ice flows. Woolman was some distance away from where the protected birds were enjoying their wintry ride but he was able to capture the superb footage with his camera's zoom lens. Woolman, a nature enthusiast, frequently posts videos of wildlife in Illinois to his photography Facebook page called NatureFirst. The video was taken at the Lock and Dam No. 18 near Gladstone, Illinois, located on the upper part of the Mississippi River. Responses to "Why fly when you can float? Bald eagles glide along the Mississippi on a block of ice"